Come spring, the managing partners of a private equity fund hope to funnel some much-needed cash into established Vermont businesses. Frank Koster and Robert Zulkoski, next-door neighbors who live in Charlotte, have initiated a “soft launch” of Vermont Works, an investment firm focused on building sustainable jobs and supporting health and wellness initiatives. The partners plan to offer $1 to $5 million investments to companies that are up and running but need additional money to hire staff, build infrastructure, or further expand, Koster said. The partners hope to raise $50 million — but that’s a long way off. Koster and Zulkoski have gotten only a few oral commitments from individual and institutional investors within and outside Vermont, according to Kevin Ellis, a lobbyist with Ellis Mills Public Affairs hired to consult for the company. The duo plan to begin official solicitations in early February, once they draw up a necessary contract that lays out details of the fund for investors. Koster and Zulkoski, who have both had decades-long careers in finance and investment management, say they have committed to personally contribute 2 percent of the fund — a combined $1 million — if they reach their $50 million goal. Koster said he’s confident that they’ll reach the lofty mark. He said that at least 85 percent of the investments will come from outside Vermont. “Bringing in those out-of-state dollars, that sends a signal to other investors that Vermont is growing,” he said. Already, Koster and Zulkoski have granted small personal investments to Vermont Farm Table, a wooden furniture company with offices in downtown Burlington, and are considering investing in THINKmd, a company founded by two University of Vermont pediatricians that created a medical app for doctors to diagnose patients in the developing world. 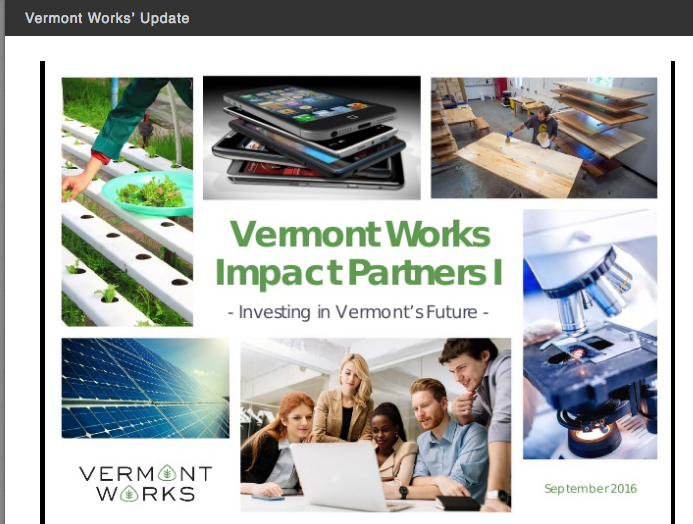 Koster said he expects Vermont Works to offer its first investment in the second quarter of 2017. They’re already looking at potential places to invest, he added. According to Ellis, the company has found support among Vermont business owners, state officials and colleges as they’ve pitched their plan over the last six months. “They recognized a niche in the world of capital invested in Vermont,” he said. A Seven Days article about startups leaving Vermont for more cash-filled pastures got the initial conversation started in the summer of 2015, Koster said. “As we looked around, as we talked to other companies, talked to business owners and entrepreneurs, there was a sense that there was a reasonable amount of early, angel-stage [capital].” There were fewer resources for “later-stage investment,” entrepreneurs who wanted to grow an already-established business. Koster thinks there’s nothing quite like his fund in Vermont. “It’s a real void that we’re trying to fill,” he said. Correction, January 12, 2017: Koster and Zulkoski are considering investing in THINKmd. A previous version of this story had an error.